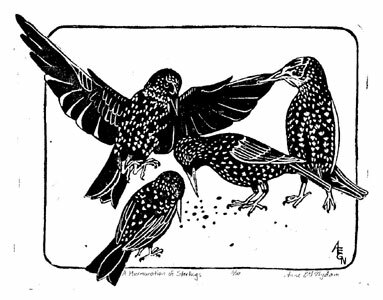 This year I bought myself a wood engraving by Andy English. 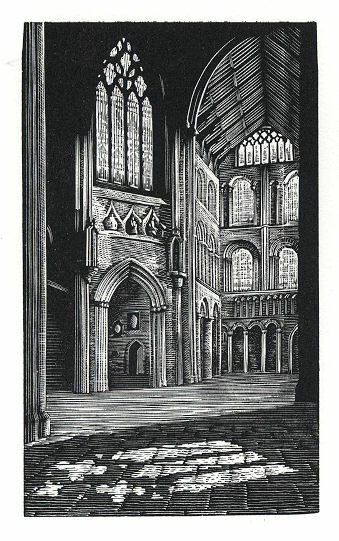 The thing that’s always so amazing about wood engravings is how tiny and detailed they are. 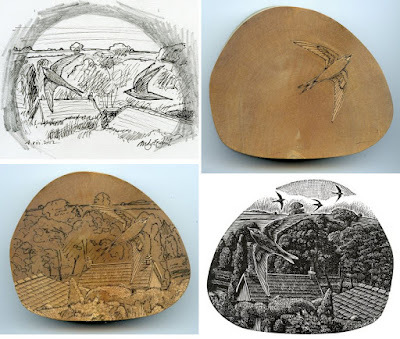 As I’ve explained before, engraving is exactly the same principle as any relief block printmaking, but the difference is that the carving is done using different tools on a surface that’s hard and without grain. There is a synthetic material called resingrave that can come in any size, but true wood engraving is done on the end grain of the wood and thus is usually limited to much smaller blocks than woodcuts carved into planks or plywoods. 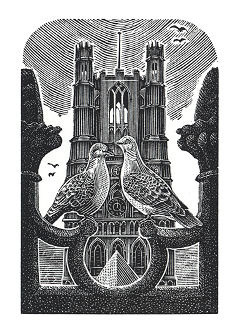 So my piece by English, showing two turtledoves and Ely Cathedral, that looks as detailed as any piece I’ve ever done, includes all those tiny lines in an area only 50x75 mm (2x3 inches). about the texture. Large areas of white aren’t carved out (because the tools are more line-making points rather than space-filling scoops. You can see this in the sky behind the swifts). And generally large areas of black aren’t left. In fact, this is my complaint about many engravings: they read as grey all over instead of satisfying contrasts of black and white. 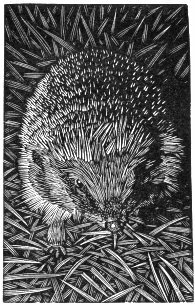 But English has lovely contrast in many of his pieces, and especially lots of black in some, such as the hedgehog. English does really beautiful work, with a lot of birds, animals, and scenes of interesting buildings and countryside - all things I happen to be particularly drawn to. So I’ve added some of my favorites, because of course I couldn’t resist. (I’ve been wanting to do a hedgehog myself for years, but have yet to do it because I don’t know how any effort of mine could avoid seeming like a cheap copy of some of the other beautifully carved hedgehogs I’ve already seen. But someday I’ll get some inspiration of what I can bring to the hedgehog block print celebration!) Anyway, I hope you enjoy these beautiful little relief block prints. This summer I found a wind-up wall clock at our local thrift store, and bought it with the thought of disassembling it for gears and other cool clockwork steampunk parts. However, when I discovered that it was in perfect working order, with a nice Westminster chime, no less, I couldn’t destroy it. On the other hand, it was an exceptionally ugly clock of prime 1973 vintage. I regret that I stupidly failed to take a “before” picture of it, and a search on the web reveals no one else proudly showing off their similar clock. So I have to assure you that the face was trying too hard to look fancy, while the case, made of cheap wood with a cheap finish, wasn’t trying nearly hard enough. Plus, the top finial was broken off. So clearly the clock couldn’t stay the way it was, and I decided that if I wouldn’t take the clock to the steampunk, I’d bring the steampunk to the clock. P joined me to assist and encourage. First step was to remove the face, and then the entire clockwork block and the chimes from the case. Next we removed the pediment, with its broken finial, and took the saw to the bottom and cut off the lower box around the pendulum, so all that remained was a square box. I next removed the board that supported the clockwork and used a jigsaw to cut away the excess wood that would cover up some of the clockwork. After some sanding we reassembled the support for the clockwork, and painted the entire case black, as there was going to be no way to make its wood look good. With the clockwork screwed back into place, it was time for embellishment. P and I went through our collection of steampunky parts and gathered some inspiration, including a roll of scientifically ruled paper which gave us the idea of augmenting our clock with a temporal anomalygraph. In case you don’t know, that’s like a seismograph, except that instead of measuring tremors in the ground, it measures tremors in time. So I outfitted the bottom of the clock with chains, gears, and a bar to support the roll of paper behind the pendulum. Of course the temporal anomalygraph needed a gauge, too, and we made that in an old watch case. We also cut a hole in the side of the clock case to insert one real amp gauge, plus two more home-made gauges. On the other side I also drilled a hole to keep the winding key. Having removed the clock face to reveal the workings, we did have to try to disguise the one visible plastic gear (this is a 70s clock, after all), and we needed to add numbers. I looked on-line for little brass numbers to add to the face, but found nothing that was really right. So I bought some small plain brass circles, and painted the numbers 12, 3, 6, and 9. Then we sprinkled extra gears and stuff about, hoping to add just enough interest, but not go overboard. I’m not sure whether I achieved the perfect balance, but I’m happy with it! The top was the final embellishment to be glued in place. I tried to echo the shape of a classic clock pediment with something a little steampunkier. The bulbs don’t light up - in fact, the two little ones are burned out, and the middle one isn’t a bulb at all but was assembled from other bits. That’s usual for my creations - all just for looks and no function. But that’s why it’s so much fun that the clock actually works, and every fifteen minutes I enjoy its chime. Plus, I can keep an eye on its gauges and get early warning of any temporal anomalies or counterfactuality events. 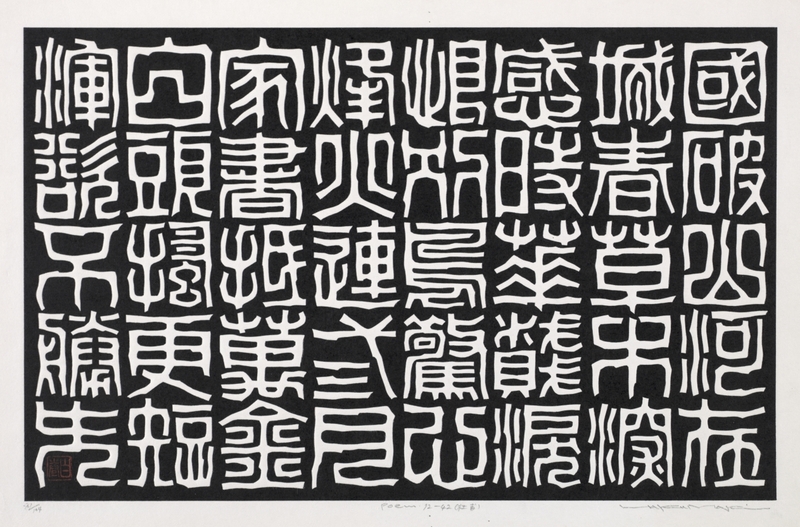 Here’s an interesting woodcut by Haku Maki (Japan, 1924-2000), entitled “Poem 12-42.” Not being able to read these characters myself, I’m unable to say to what extent they’ve been distorted or altered for purposes of Art. In fact, I have no idea what this says at all, if it even says anything. Haku Maki did illustrate a translation of Festive Wine: Ancient Japanese Poems from the Kinkafu, in 1968-9, and I’m guessing this may be one of those illustrations. Unfortunately I can’t state that for sure because the Cleveland Museum of Art, which owns this piece, simply doesn’t give much info about it on their web site. So forget the background, and just look at it as an image in black and white, a composition of lines and shapes. The characters are arranged in a grid, each being given a square space, and the more complicated characters read lighter because they have more white lines. However, although the structure of the piece is severely geometrical, the lines and shapes of the characters themselves are rather wobbly and organic. 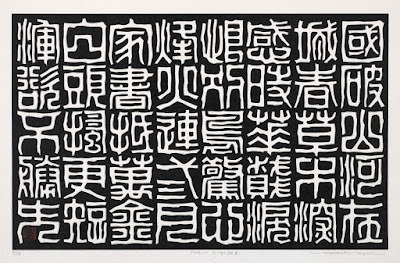 I’m sure someone who can read Japanese would be getting a very different, more nuanced sense from this relief block print. It certainly adds a major caveat to any claims about The Universal Language of Art! Nevertheless, I like the look of it. 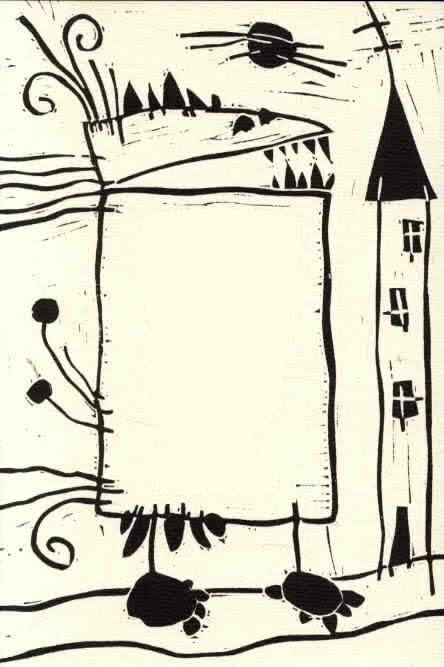 I like the pattern, and I even like the feeling that there’s hidden meaning here, even though I can’t interpret it. Brian Andreas calls his small pieces of writing stories, not poems, and I think he’s probably right. All the same, they have much of poetry about them: the vividness of tiny moments so specific that they turn out to feel universal. Many of his stories have an air of fantasy, including people flying, strange creatures, and generally magical realism. In looking him up for this post I discovered that he’s become successful enough for his empire to expand into all sorts of feel-good products that may possibly verge into platitudinous schlock. But I have found many of his earliest pieces to be delightfully quirky, surprising, poetic, and mostly true. Here are a few of my favorite stories celebrating the imagination. & she told me about stars called blue squares & red swirls & I told her I’d never heard of them. You have to imagine it on your own. O no, she said, you can’t say just any old thing to the Wind. Only the Deepest Secrets will do. I have always thought that stars turn into white birds in the morning light & sleep with their heads under their wings until the dusk begins to walk through the streets. Silhouette art has some obvious features in common with relief block prints. The black and white without halftones is the most obvious point, so that things are defined by edges, and everything must stand against its opposite for a background. Also, of course, those silhouettes that are actually cut from paper share with carving a block the idea of cutting away whatever is to end up white, and leaving behind whatever is to be black. 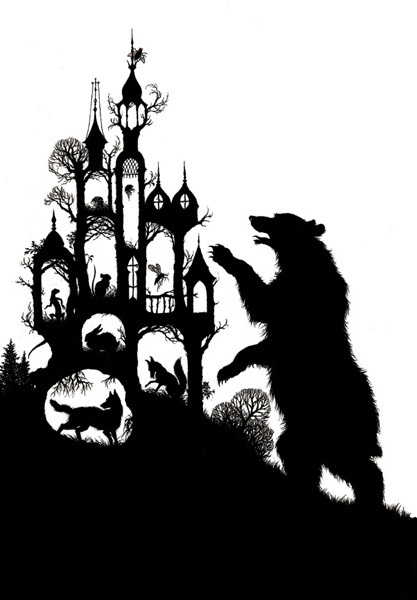 I like the look of silhouettes, and this past Christmas my aunt gave me a book illustrated by Agnese Baruzzi. I’m always talking about “black and white,” but Baruzzi’s illustrations are crazy, bright color combinations. Some are black on a rich colored background, but others are purple on lime or magenta on orange. The especially nifty thing about this book (and some of the others illustrated by Baruzzi) is that each page is double-layered: a background page and a die-cut silhouette overlay so that you really do get the texture of the cutting. I’ve picked a few of Baruzzi’s illustrations involving fantasy themes, plus the number book below, which I just really like. 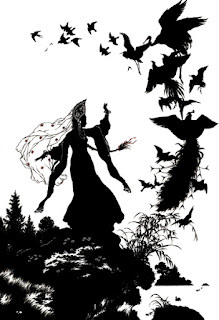 A silhouette artist whose work is especially gorgeous is Niroot Puttapipat, who does use black and white (though often with punches of red or another color), and who works in the Golden Age style reminiscent of Arthur Rackham. Like Rackham (and Baruzzi), Puttapipat also has done plenty of work illustrating folk and fairy tales, so of course I’ve chosen illustrations for this post accordingly. 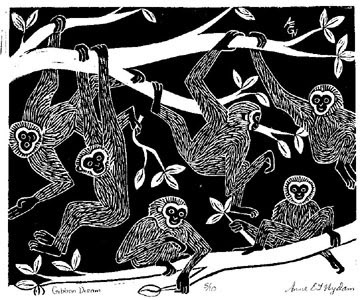 I believe that Puttapipat does not actually cut paper for his silhouettes, so he doesn’t have the carving in common with relief block printmaking, but it would be interesting to experiment with this style in a block. In any case, the thought process of planning a picture with only black and white is the same. How much pattern do you include? What detail lines can you get away with leaving out? What composition shows all the necessary elements of the picture to best advantage? Puttapipat and Baruzzi have very different styles, but both are a lot of fun to look at. Both have a magical feel. And both very much please my block-print-loving eye. 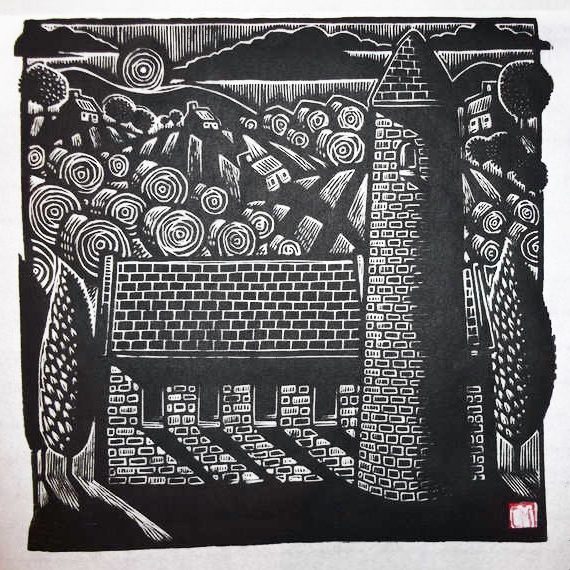 Here’s one more Irish relief block print that I like a lot. It hits my sweet spot for balance between realism and stylization. I’m not sure whether it represents a real church and round tower as they are all over the place in Ireland, although not so many with their conical roofs intact. But whether it’s a real scene or an iconic fantasy, it evokes a mythical landscape of plant and stone. I like the shadows, black in the low sunset light. I like the higgelty-piggelty angles of the little cottages in the background. I like the edges of trees and clouds disregarding the frame of the block. 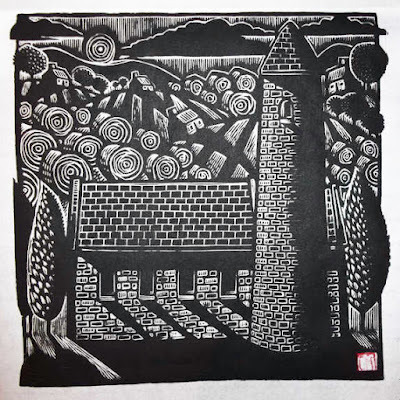 While we were in Ireland this summer I took lots of photos of round towers, as well as castles and ruined monasteries, and I plan to make a few Irish block prints myself. I hope I can capture as much character and individuality in mine as Belfast artist Connor Maguire has done in this one. 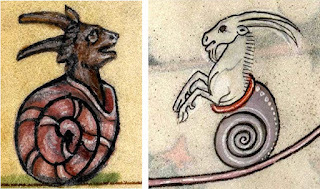 Here’s a funny thing that’s just come to my attention: it turns out that among all the grotesques and drolleries in medieval illuminated manuscripts, a particularly popular motif is snail-hybrids. Now the name for these critters (a new word for me!) technically means “mollusc-form”, but mollusca is a huge phylum and we really aren’t referring to anything here but whorled snails. 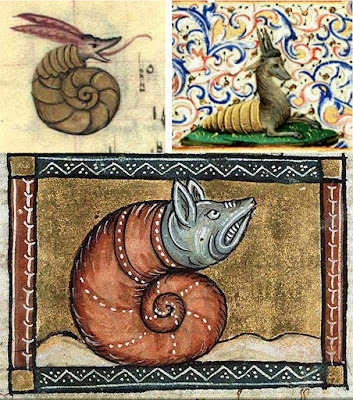 No clams or other bivalves, no octopuses or other cephalopods, no limpets, nudibranchs, or slugs… Not that some of those wouldn’t make for interesting hybrid creatures, too, but it seems that what interested our medieval manuscript illuminators was spiral shells. So here are some of my favorite examples. These tiny, sometimes wonderfully detailed depictions of marvelous malacomorphic creatures come with no explanation. They have nothing to do with the texts they adorn (which are primarily Bibles and Books of Hours). No names or labels tell us where these critters might live, or what their habitats or habits might be. Are they usually the size of a normal specimen of the animal that makes up their front half? Or are they they size of little garden snails? Or somewhere in between? Do such creatures still exist, or are they all extinct now? I suppose they’d be pretty easy to hunt, despite the protection of the shell. They are presumably not speedy. What a shame it would be if they were all hunted to extinction at the beginning of the Renaissance. 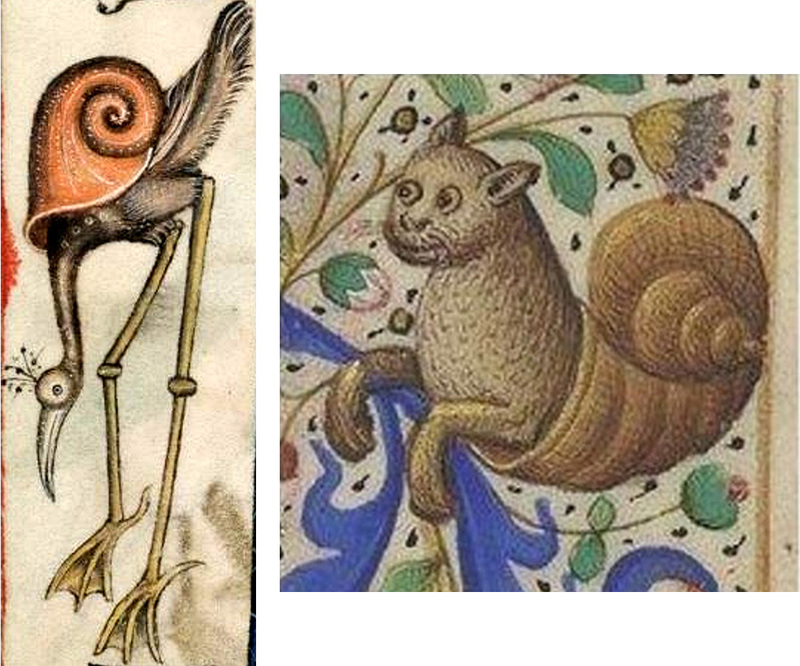 I begin at the top with my two favorites, a lovely long-legged snail-bird and an exceptionally happy snail-cat. 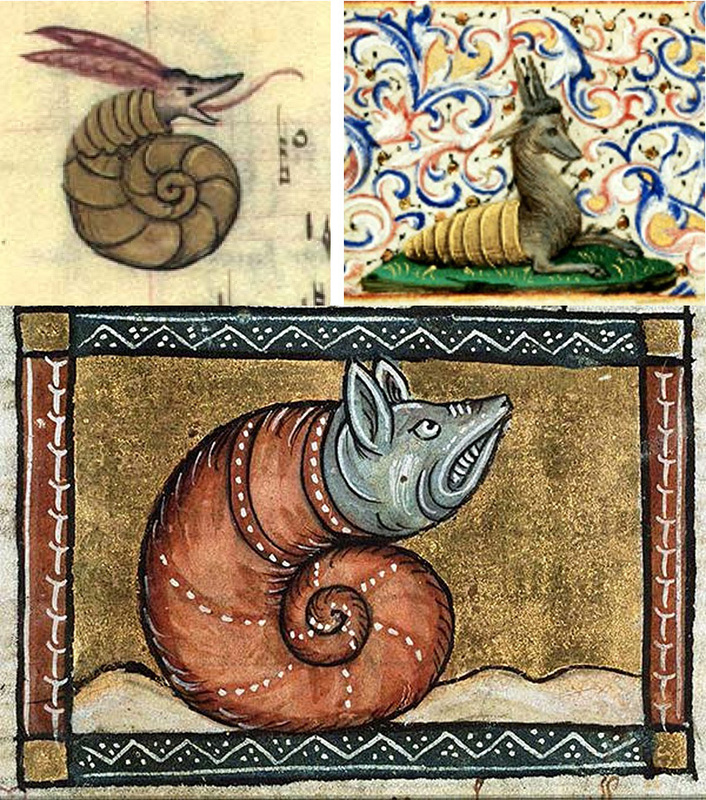 Next is a snail-griffin, interesting in that it has hind legs, unlike any of these other malacomorphic beasts, and another snail-cat, these two from the same manuscript and by the looks of it the hand of the same malacomorphophile artist. The snail-dog dates a bit later, and reminds me of “snips and snails and puppy-dog tails.” Griffin and cat are quite masterly and finished, while the dog is much sketchier in style. Next I have two snail-goats. Does the first have forelegs that are simply pulled farther back into its shell, or does it, true to its snailier nature, have no legs at all? I conclude with the malacomorphs that I don’t know how to identify. 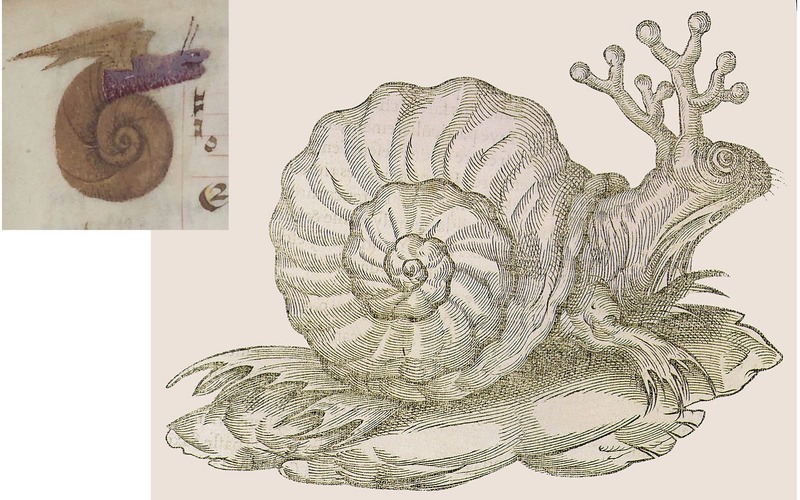 There’s the flying snail, pure and simple, which, from its appearance in a book of music, I like to think flutters about singing like a canary. 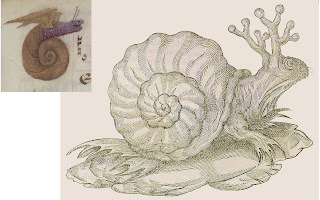 Then there’s the snail-monster with branched antlers, hands that resemble those of a Dr Seuss character, and is that a fishy tail sticking out the back? I think the next little one is a snail-aardvark, but there’s even a suggestion of armadillo about the ridges on the shell. The creature with the unusually cone-shaped shell must be some sort of snail-stag or -antelope, I think, and the final creature? Snail-opossum? Snail-shrew? Whatever it is, it’s peeved! Snail-opossum, from Der Naturen Bloeme by Jacob van Maerlant, c 1350. Here’s the newest print, finally finished after taking the better part of three shows to carve. I have no idea how many hours I actually spent on the carving, but obviously it must have been quite a few! 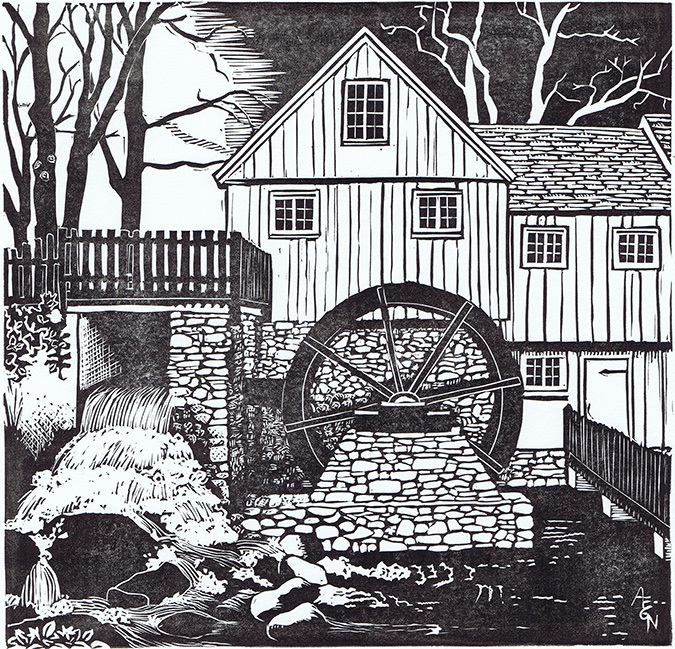 This is the Jenney Grist Mill in Plymouth, MA. I used a photo I took there for reference, and this was a pretty complicated image to convert into black and white. I’m pretty pleased with my choices on simplifying some things, but keeping lots of fine detail in other places. I’m also well satisfied with how I used a variety of textures to indicate a variety of tones, and even some areas of shading. I like the contrast of the big round wheel with the rectangles and triangles of the buildings, and the contrast of the roiling water with the straight lines of the boards and railings. 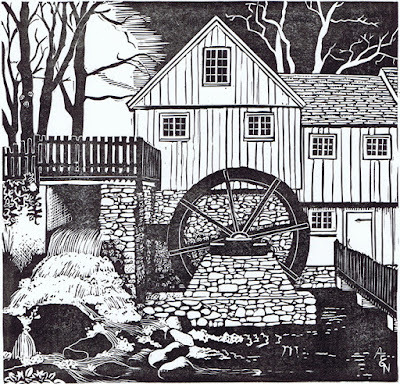 Who could resist the scenic wonder of a waterwheel?